Kurt of Gerolstein: The famous Ernestine Esclozas: what a secret stunner! The famous Ernestine Esclozas: what a secret stunner! 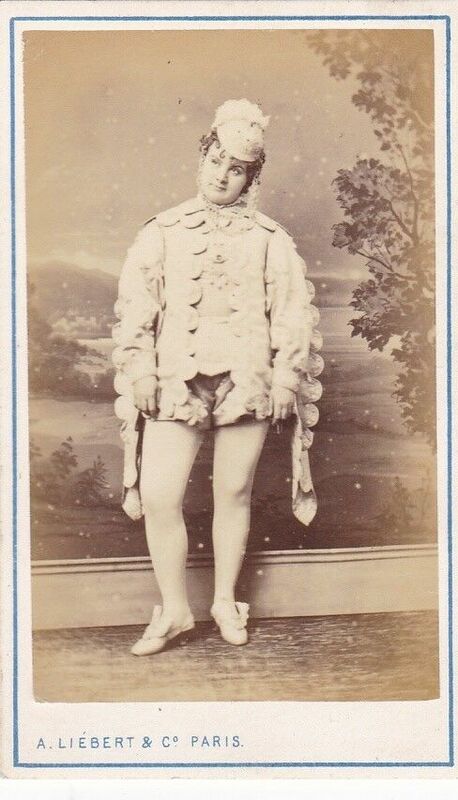 If I could choose to see in action, today, one single performer from the world of the C19th French musical theatre, I know exactly whom I would select. It has always been Madame Desclauzas. So you would think that I would have covered her life and career minutely. I find that I didn’t. 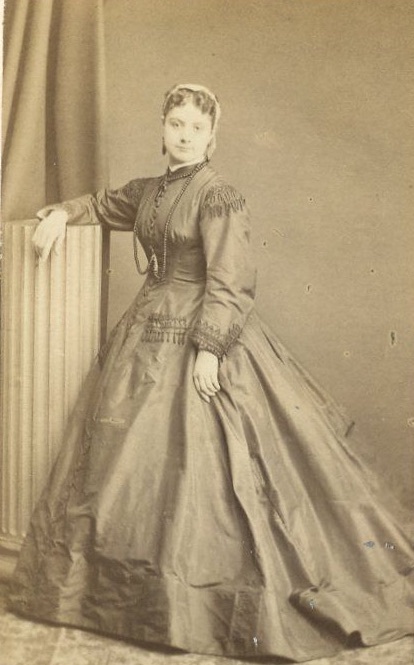 “DESCLAUZAS, Marie[ARMAND, Malvina Caroline Ernestine] (b Paris, 13 July 1841; d Nogent-sur-Marne 25 March 1912). 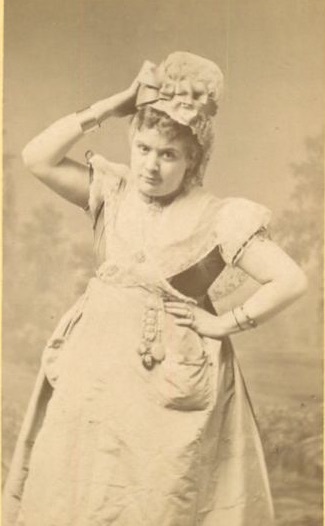 Buxom and eventually hefty star of the opérette stage who became the most admired musical character comedienne of her era. 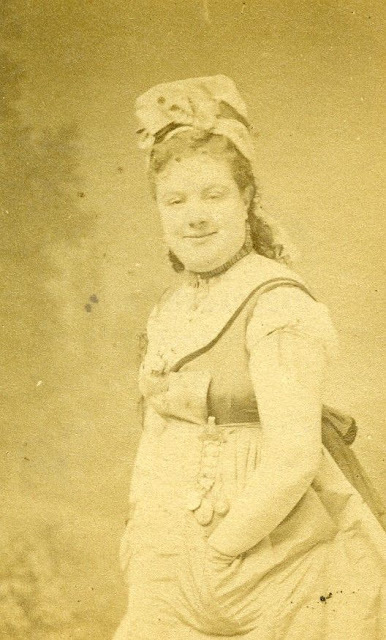 Marie Desclauzas began her stage career as a child, touring and -- in her mid-teens -- appearing in Paris at the Ambigu, the Cirque and the Châtelet under Hostein in dramas and in féeries where her attractively rounded figure earned her a series of leggy travesty rôles. She then turned to the world of opéra-bouffe and there made herself a solid career as leading lady. 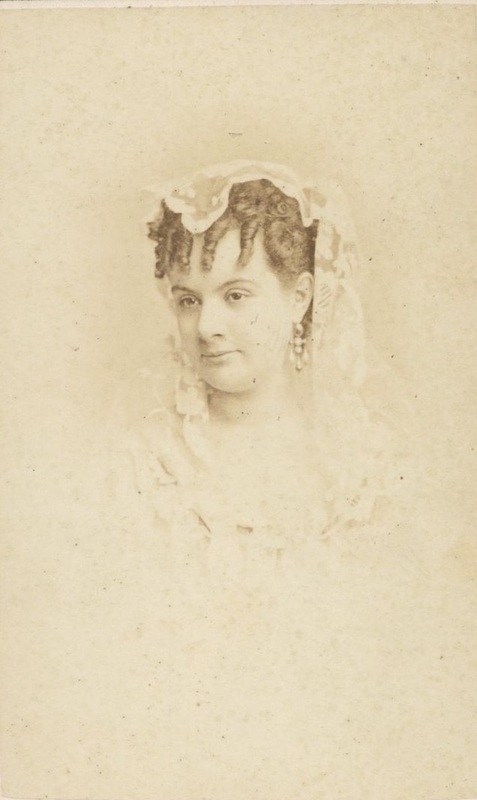 This seems to have been initiated by a co-starring season (with the young Rose Bell) under the management of Jacob Grau and James Fisk in 1868-9 in America, where she appeared alternatively as Geneviève and Drogan in Geneviève de Brabant, as Boulotte, as Fleur de Noblesse (L'Oeil crevé), Piquillo (La Périchole), Césarine (Fleur de thé), Galswinthe (Chilpéric) and in La Vie parisienne. 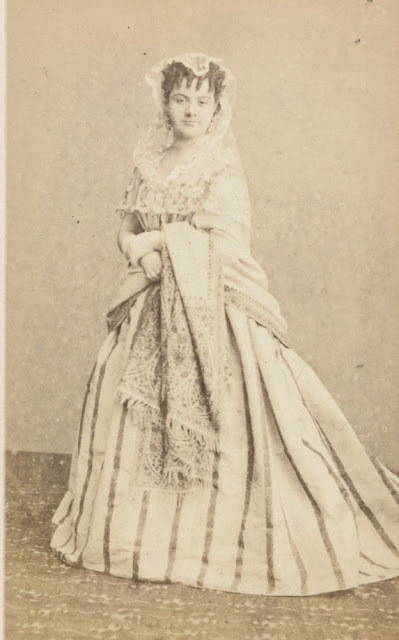 She followed up with seasons in Nantes, Marseille, Bordeaux, Toulouse and Alexandria before being appointed prima donna of the fine company at the Brussels Théâtre des Fantaisies-Parisiennes. 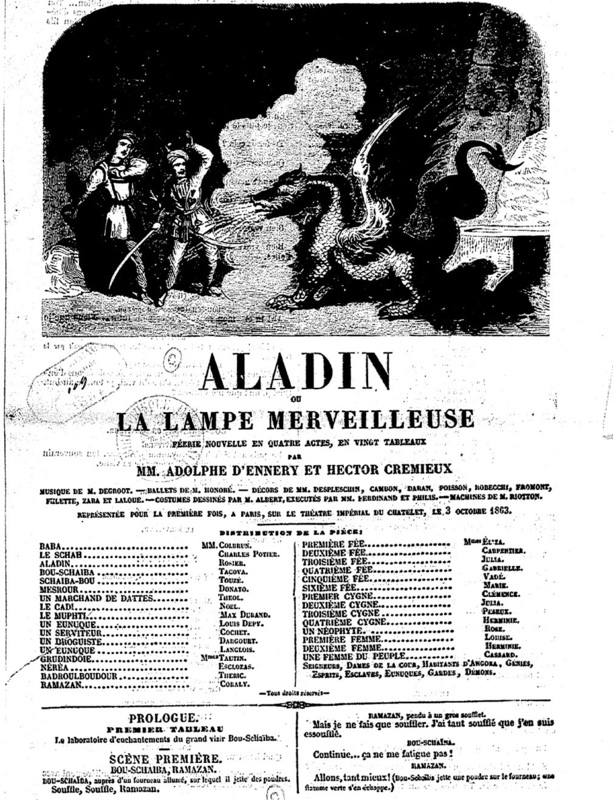 When that theatre's director, Eugène Humbert, produced the latest opéra-comique by the young Charles Lecocq, whose Les Cent Vierges had done so well for them earlier in the year, 32-year-old Desclauzas was duly given the leading rôle. 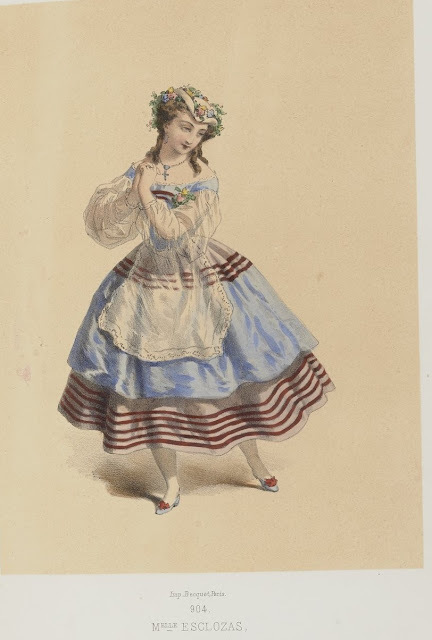 She made such a success as Madame Lange, the luscious, plotting merveilleuse of La Fille de Madame Angot that, when the piece was taken to Paris and scheduled to be recast with metropolitan performers, Lecocq himself insisted that the Belgian creatrice of Lange be retained. Humbert released his star to the management of the Folies-Dramatiques and Desclauzas triumphed all over again in the capital. After a long stretch playing Lange, she appeared as Manon in Auguste Coèdes's La Belle Bourbonnaise, as La Belle Cousine in Hervé's Alice de Nevers, and as Heloïse in a revival of Litolff’s Heloïse et Abélard (1874), but her now rather considerable bulk, especially when not hidden under the useful lines of Angot's empire gowns, barred her from most leading rôles and she tactfully changed direction, at 35, to make a speciality of character rôles which required a strong singing voice and a powerful personality rather than a shapely leg. In the 20 years that followed Desclauzas created rôles of this kind in a whole line of opérettes and plays, many at the Théâtre de la Renaissance and for Lecocq, and many written especially to suit her now thoroughly uncovered comic talents. 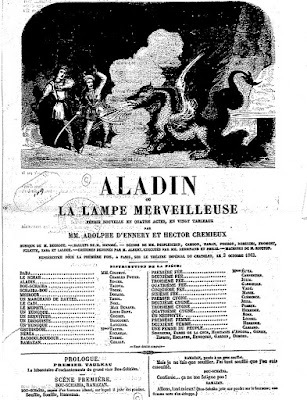 These included the spectacle La Mère Gigogne at the Château d’Eau (1875 ‘she is given an opportunity for a repetition of nearly every favourite air in her repertoire’), the Parisian production of Le Roi d'Yvetôt (1876) which she had created in Brussels three years earlier, Le Petit Duc (1878, Diane de Lansac, Directrice of the Académie pour Demoiselles Nobles), La Camargo (1878, Donna Juana de Rio-Negra), La Petite Mademoiselle (1879, Madelon), La Jolie Persane (1879, Babouche), Les Voltigeurs de la 32ème (1880, Dorothée), which she played along with Le Petit Duc, La Petite Mariée (Lucrézia) and Giroflé-Girofla (Aurore) in London in 1881, Janot (1881, Alexina), Mademoiselle Moucheron (1881, Mme Boulinard), the disastrous Le Saïs (1881), Madame la Diable (1882, Baronne Paméla), La Bonne Aventure (1882, Beppa), Ninette (1882, Countess Kouci-Kouca), Les Trois Devins (1884, Christine), Les Petits Mousquetaires (1885, Armide de Tréville), Il était une fois (1886, La Reine Virginie), L'Amour mouillé (1887, Catarina), Le Petit Moujik (1896, Mme Picou), Les Fêtards (1896, Madame Maréchale) and La Petite Tache (1898). 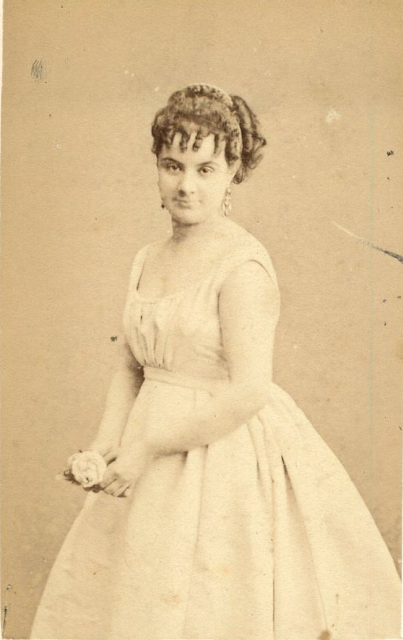 She also appeared in such repertoire rôles as the Marquise d’Enface of L’Oeil crevé, Aurore (Giroflé-Girofla), Lucrézia (La Petite Mariée), Marcelline (Belle Lurette), Marguerite (Le Canard à trois becs) and Fanfreluche (La Poule aux oeufs d'or), in Bisson’s military Mam’selle Piou-Piou (1889, Madame Papillon) at the Porte Saint-Martin, and took time off to appear, with equal success, in comedy for Koning at the Gymnase (Mme Baudoin in Les Amants légitimes, Deborah in L'Homme à l'oreille cassée, Comtesse Gypsy inAutour du mariage etc), at the Porte St-Martin in the fantastical La Montagne enchantée (1897, Fatima) and elsewhere. 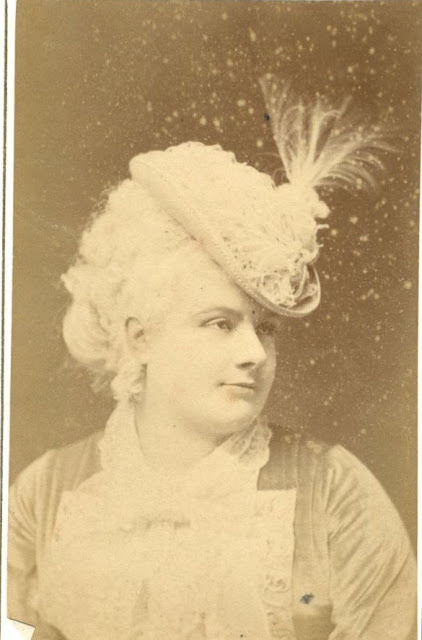 She officially retired from the stage in 1910, just two years before her death at the age of 71. It happened thus. 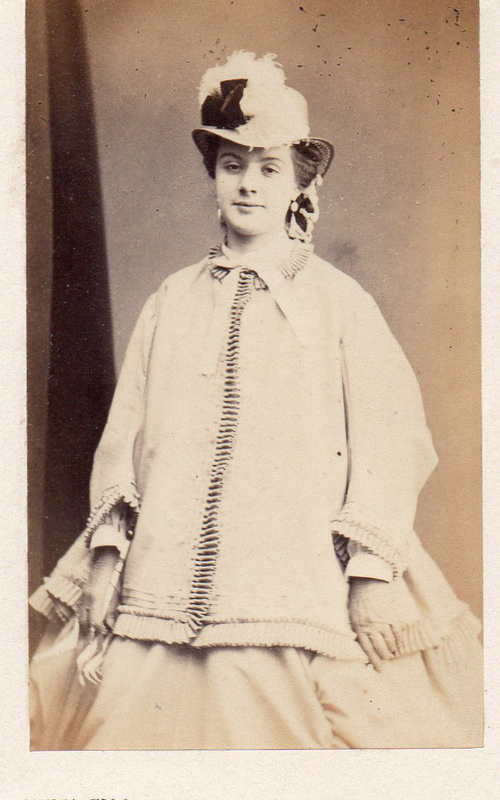 While netting the for-sale picture of Mlle Géraldine on French e-bay (see yesterday’s article) I chanced on the photo of a stunning young woman. She caught my eye because I thought she looked amazingly like a taller version of my Austrian grandmother as a teen-aged Mädchen. Who was she? Mdlle Esclozos. Haha. Come to think of it, she looked like a young, slim version of Marie D, too. Could someone have misspelled her? Seemed not. 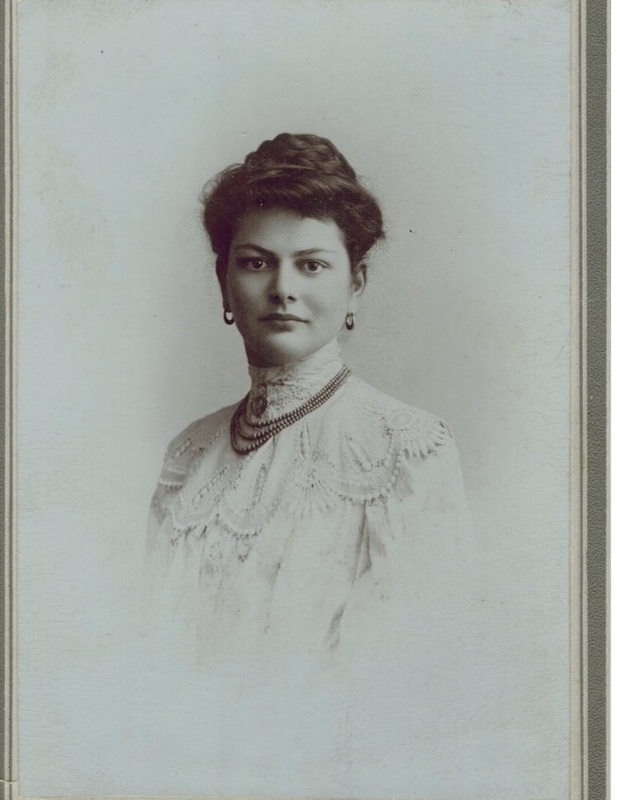 A second, third and fourth photo surfaced with the same name … But, damme, it WAS her. Illiterate Frenchmen! So I began a check. And out it all came. Well, a lot of it. 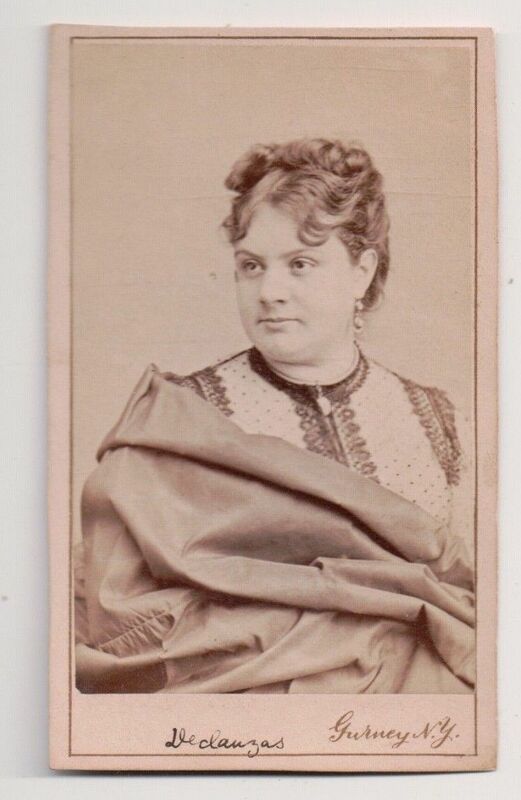 The reason I couldn’t formerly find Marie D before 1868 was that she, too, had played the name changing game. For some eight years she had, previously, been Esclozas, or Esclauzas. So I started again. 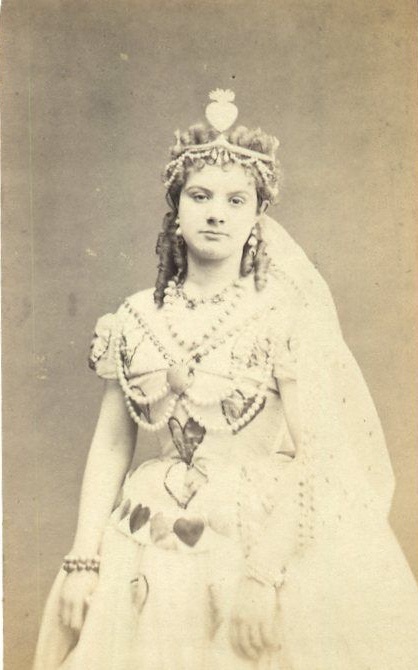 There she is at the Cirque Impérial from 1860-2, playing Heloise in the 5-act drama Heloïse et Abélard, and playing in the féeries La Poule aux oeufs d’or as the little heroine, Florine (‘Madame Esclozas s’est fait remarquer par une jolie voix’) and Rothomago (Bruyère), alongside Mme Geoffroy and the dwarfish Judith Ferreyra.